When you were a little kid and first laid your eyes on a ping pong table, you probably just ran over to the table, grabbed a ball and started hitting it along with your hand. While that might make for a fun way of playing, the real table tennis game has rules that need to be followed. In this section, we cover the rules of this very popular indoor table game. There are many things to consider in this game and here we include a list of in-depth rules to make you clear on how to play the game the right way. This list is perfect for the novice who has no idea what they’re doing, or for the established professional who needs a reminder. A home tennis table is usually a place for some good old fashioned leisurely fun, but it can be the scene of some heated disputes as well. A common understanding of some basic rules is a good way to make sure your ping pong table is the site of more jovial sounds than irate ones. First and foremost: This is by no means a comprehensive list of the Rules of Table Tennis as established and updated by the International Table Tennis Federation. For the complete Laws of Table Tennis handbook, consult the ITTF’s official website. The entire table area is in play, including the edges. Serves may land anywhere on the opponent’s side of the table in singles play. Lines are for doubles play, during which the ball must land in the opposite quadrant of service. Paddles must be standard size, weight, and shape for table tennis. Serves must touch the server’s paddle, the server’s court, and then the opponent’s court. If a ball touches the net and lands in the opponent’s court, a “let” is called and the serve is repeated. Players serve five points and then the serve is given to the opponent for the next five. If the ball touches the net during play and falls into the opponent’s territory, the shot is good. The server serves fails to serve the ping pong ball into playable territory (i.e. the opponent’s court). Either player fails to make a successful return. If the ball is hit before it bounces on your side (unlike tennis). If the ball bounces in a player’s court twice before she/he can successfully return it. If you hit the ball twice without returning it to your opponent’s court. If either player touches the net. If either player touches the table with her/his free hand during play. If either player moves the playing surface, even inadvertently, during play. Determine opening serve by volleying or a coin toss. In successive games, you may choose if serve goes to the winner or loser of the previous game. The winner is the first player to reach 11 points. Player must win by 2 points. A match usually is a best of five or best of seven series. Players decide this beforehand. Official matches are played to 11 points in a best of seven formats. Service is automatically given to the trailing opponent when a player reaches 10 points. Players switch sides after each game. Remember, these table tennis rules are hardly set in stone. They simply provide a good place to start for beginning players. Feel free to add a few rules of your own or dismiss some of these suggested ones. The important thing with ping pong house rules is that both players understand and agree to them before the match begins. If you want to know more, you can get the table tennis handbooks at ITTF office website. The site also provides Olympic and international table tennis rules in PDF format which you can download and print out for easy reading. Table Tennis is an indoor game that is played by hitting a light – ball over a net with the use of rackets or paddles similar to the famous game tennis. The difference between the two is that table tennis or ping pong as it is commonly called is played on a hard rectangular table with a net in the middle and uses of a smaller plastic ball and small wooden rackets. Playing the game can really look quite easy especially to anyone who is familiar with tennis. However, that’s where the similarity ends. The rules of table tennis are really quite different from that of tennis and it should be learned at heart if ever anyone wants to be good at it. Like in any type of sport, learning the rules of table tennis starts with the familiarization of the different types of equipment that are needed in playing the game. Each type of equipment has its own specifications as specified by the International Table Tennis Federation or ITTF and are used in almost all types of table tennis games and competitions. The different types of equipment include the ball, the table, the net, and the rackets or paddles. The next step after knowing the different types of equipment is to know how to play the game itself. Like in tennis, it is started with the use of a serve. The serving player stands at the end of the table and holds the ball with the palm of his hand. The ball is then thrown upward over the minimum required height of 16 centimeters and then is hit in any way as long as the ball bounces once on the server’s court before going to that of the opponent’s. If the ball hits or grazes the net, it is called a let and the serve must be repeated. During service, it must always be remembered that the ball must not be hidden or obstructed from the views of the opponent and the umpire. Then players then alternate the service every two points until 11 points is reached by one of them. This is considered being the end of the game. In the event that both sides achieve ten points each, the game continues with the service alternating after every point until a two-point advantage is reached by one side. These are the basic rules of table tennis that must be learned by anyone who is planning to play the game. Advanced rules are also added in the case of doubles or mixed games however, they can easily be learned. Right Click to download in PDF file. The intent of the new service rule is to make the rule itself clear and easy to interpret. 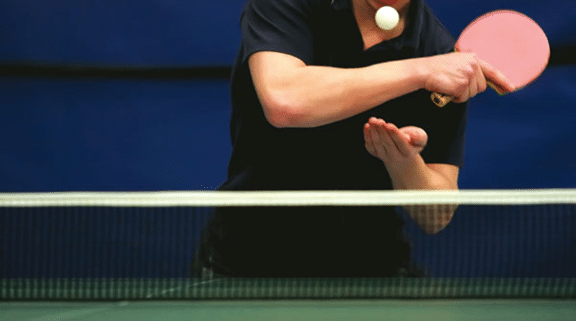 The new rule is designed to make the Service in table tennis an “OPEN” technique which is fully visible to the receiver at all times. A detailed instructional and explanatory package will be distributed by the ITTF’s Umpires & Referees Committee to all International Umpires in order to guarantee consistent application of the rule and respect of the spirit of the rule. In the meantime, the ITTF is distributing an explanatory package to the National Associations in which the new service rule is demonstrated in written and visual form. As soon as the free hand (the hand holding the ball in service) and arm has projected the ball upwards, the free hand/arm must be immediately removed to the side. In other words, the free arm must not remain in an area between the ball and the receiver- it has to be out of the line of sight of the receiver and the ball as demonstrated in the attached Powerpoint presentation, video streams, and photos. If the server could imagine a triangular space created by the ball and both net posts, then extends this space upwards to head level, the server must then ensure that no part of his body or clothing enters this space (or remains in this space) after he projects the ball upwards in service. This will ensure that the space between the ball and the receiver remains clear of any obstructions. This is a simple way to ensure that the service meets the legal requirements. A slight modification from current services is required. Players must learn, in forehand services, to swing their free arm out of the way as fast as possible to create a legal, open and visible service. 2.6.1 Service shall start with the ball resting freely on the open palm of the server’s stationary free hand. 2.6.3 As the ball is falling the server shall strike it so that it touches first his court and then, after passing over or around the net assembly, touches directly the receiver’s court; in doubles, the ball shall touch successively the right half court of server and receiver. 2.6.4 From the start of service until it is struck, the ball shall be above the level of the playing surface and behind the server’s end line, and it shall not be hidden from the receiver by any part of the body or clothing of the server or his doubles partner. (The purpose of this rule is to make the ball visible to the receiver at all times during service. The serving player or pair must not take any action which would prevent the receiver from seeing the ball from the time at which it leaves the server’s hand and seeing the side of the racket used to strike the ball). 2.6.5 It is the responsibility of the player to serve so that the umpire or the assistant umpire can see that he complies with the requirements for good service. 2.6.5.1 If there is no Assistant Umpire, and the umpire is doubtful of the legality of a service he may, on the first occasion in a match, warn the server without awarding a point. 2.6.5.2 If subsequently in the match a service by that player or his doubles partner is of dubious legality, for the same reason or for any other reason, the receiver shall score a point. 2.6.5.3 Whenever there is a clear failure to comply with the requirements for good service, no warning shall be given and the receiver shall score a point. 2.6.6. Exceptionally, the umpire may relax the requirements for a good service where he is satisfied that compliance is prevented by physical disability. The amended versions of the laws and regulations affected by the AGM decision to adopt the 11 point scoring system are shown below, with the changes underlined. These laws and regulations came into effect on 1 September 2001. 2.13.3 After each 2 points have been scored the receiving player or pair shall become the serving player or pair and so on until the end of the game, unless both players or pairs score 10 points or the expedite system is in operation, when the sequence of serving and receiving shall be the same but each player shall serve for only 1 point in turn. 2.13.6 The player or pair serving first in a game shall receive first in the next game of the match, and in the last possible game of doubles match the pair due to receive next shall change their order of receiving when first one pair scores 5 points. 2.15.1 Except where both players or pairs have scored at least 9 points, the expedite system shall come into operation if a game is unfinished after 10 minutes’ play or at any earlier time at the request of both players or pairs. 2.15.3 If the expedite system is introduced, or if a game lasts longer than 10 minutes, all subsequent games of the match shall be played under the expedite system. 3.4.4.1.2 brief intervals for toweling after every 6 points from the start of each game and at the change of ends in the last possible game of a match. Table Tennis is such a commonplace sport that sometimes we forget that some people who are starting out don’t really know how to play the game. Here is a great video that explains the details of how to get the most enjoyment out of your table tennis racket and equipment. The paddle you use needs to be red on one side and black on the other side. It cannot be red or black on both sides. You cannot simply use any rubber as you like as the rubber that covers each side of the paddle need to be authorized by the ITTF. If approved by the umpire, it allows you to have a few small chips or tears in the rubber. You cannot change your racket during a match unless somehow it gets damaged so badly that it becomes unusable. You must get permission to change it if this is the case. The top of the net must be 15.25cm above the playing surface along its entire length. Just use a ruler to double check the measurement. You are not allowed to move the table, touch the net, or put your free hand on the table while the ball is in play. You could even take a seat on the ping pong table if you are not intended to move it! Always check that the brakes are on the table before playing, so you don’t accidentally move the table if you bump it. When serve the ball, you need to ensure that the ball is always visible to your opponent, if you are hiding the ball from your opponent when you serve, it is considered foul. Therefore, the server must keep his free arm out of the way between the ball and the net. When you toss the ball, you need to make sure that the ball is being thrown up vertically having no spin. For the standard rule, the ball needs to be tossed up no less than 16cm. After tossing the ball, you need to hit the ball on its way down, NOT on its way up! It is legal to hit the ball with your fingers, or your racket hand below the wrist, or even any part of the bat (edge or handle). However, in case you have your paddle dropped, you will not allow to returns the ball by hitting with your hand since it’s not your paddle hand. Also, you can’t hit the ball twice (like with your fingers and then your racket). You can’t even throw your bat at the ball, your hand must be touching the bat when it hits the ball. You are allowed a maximum rest time of one minute between games. You need to leave your paddle on the table tennis table except if the umpire provides you with approval to take the paddle with you. If you need to take a rest, you can call a time out for 1 minute during a match. Due to the cause that table tennis is a high energy game, a player is simply permitted to towel off every 6 points during a match. The rule is set with the purpose of avoiding interrupting the flow of play. Let the umpire know if sweat gets on your rubber, or on your glasses lenses. Warm up is no longer than a two-minute practice period on the table. You are not allowed to wear a tracksuit during a match except if you are granted permission by the umpire. Nonetheless, you are allowed to wear bike shorts underneath your normal shorts, provided they are the same color. 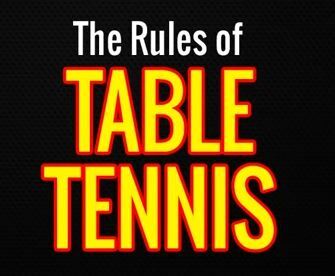 For more detailed rules and regulations be sure to read through the Laws of Table Tennis for a more complete understanding of this exciting and invigorating sport.